Although there are some exceptions, if you are a minor between the ages of 14 and 17, and you want to hold a job in the state of Indiana, you will need to acquire a work permit. Both federal laws and Indiana child labor laws regulate the ages that minors may be employed, restrict the hours they are allowed to work and limit the types of jobs that are appropriate for minors. A work permit is a document that shows a person between the ages of 14 and 17 is legally allowed to work in the state of Indiana. Although there are a few exceptions, minors under the age of 14 are generally not permitted to work. Indiana laws make it unlawful for an employer, except in limited circumstances, to hire 14- to 17-year-olds without a valid employment certificate, or work permit, on file in its office. Because both federal and Indiana state laws allow the employment of minors only under limited circumstances, a work permit is required in order to show that the minor and employer understand, and are complying with, all applicable child labor laws. Work permits are issued by the school district where the minor lives or by the accredited school that the child attends. A valid work permit must state the full name and date of birth of the child, the name and address of the applicant’s parents, the employer’s name and address and the nature of the work. The work permit must certify that the minor has appeared before the officer that issues the permits and has submitted all required documents. Work permits are required year-round. Schools must have an office open during the summer and over school breaks to issue work permits. To get a work permit, the minor applicant must provide his accredited school with two documents. First, the minor’s prospective employer must fill out an Indiana Intent to Employ form, found on the state's department of labor website. 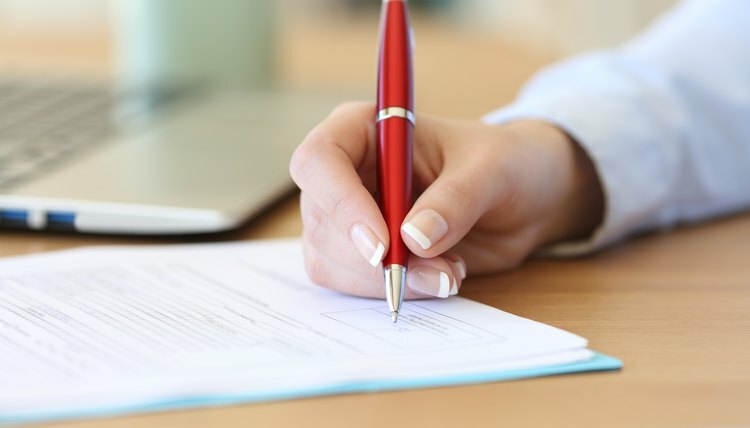 This form provides the accredited school with notice of the employer’s intent to hire the minor, the hours the minor will work and the type of work involved. Second, the minor must provide proof of age. The minor must return, in person, the correct documentation to the issuing officer at her accredited high school. The accredited high school is either the school the student attends; the school in the minor’s school district in the case of home-schooled students or minors not in school; or the school in the employer’s school district if the minor is coming to work from another state. If the documents are in good order, the work permit should be issued. The employer must keep the issued permit on file at the employment site. Schools have the discretion to refuse or revoke a permit due to the student's poor attendance or academic record. If the minor believes that the school is refusing to issue the permit for a reason other than attendance or academics, he may contact Indiana's Department of Labor. A minor who wants to work more than one job must get a separate work permit for each job. The total number of hours between all jobs must comply with the Indiana Department of Labor rules. Three hours per school day and eight hours on Fridays that are school days. Eight hours per non-school day and Fridays that are school days. A total of 18 hours per school week. A total of 40 hours per non-school week. 14- and 15-year-olds may not work before 7:00 a.m. or after 7:00 p.m. on nights before school. 14- and 15-year-olds may work until 10:00 p.m. on nights not followed by a school day. This permission is a departure from federal child labor laws and was added by the Indiana legislature in July, 2018. 30 hours total per school week. 40 hours total per non-school week. Until 10:00 p.m. on school nights. Until 11:00 p.m. on school nights. Until midnight on non-school nights. 40 hours per school week. Eight hours per school day. 30 hours per school week. Until 10:00 p.m. on nights followed by a school day. Until 11:30 p.m. on nights followed by a school day or until 1:00 a.m. on nonconsecutive nights followed by a school day, up to two school nights a week. Indiana child labor laws also dictate the required breaks for employees under 18. If a minor works six or more consecutive hours, she must get one or two breaks for a total of at least 30 minutes. Breaks must be documented in a break log and kept at the employment site. Must attend school full-time or provisions must be made for the equivalent schooling. Must be accompanied by a parent to all rehearsals, appearances and performances. May not perform at a cabaret, dance hall, night club or tavern. Under most circumstances, minors who are at least 12-years-old do not need a work permit to work as a youth referee, umpire or official at sporting events. Work permits are not required as long as the minor is certified through a national certification program; the events are for children younger than the minor who is working the event; there is a person 18 or older also working the sporting event; and parental permission is on file. If these criteria are met, the minor does not need a work permit and is exempt from Indiana hour restrictions and break rules. If the criteria are not met, then Indiana child labor laws apply. Work permits are not required for minors working in businesses solely owned by the minor's parent, but all other child labor laws apply, including age restrictions and prohibited occupations. Minors who volunteer for nonprofit businesses do not need work permits and are exempt from hour and break restrictions, but cannot perform prohibited or hazardous duties as defined under the federal Fair Labor Standards Act. A minor between the ages of 14 and 17 does not need a work permit to work as a farm laborer, babysitter, golf caddie or newspaper carrier as long as the work takes place outside of required school hours. Work in any capacity in a workroom where goods are manufactured, mined or processed. Operate, tend, set up, adjust, clean, oil or repair power-driven machinery. Bake or cook, except on grills or stoves with no open flame. Work in freezers or meat coolers, except to occasionally retrieve or restock food items. Perform most duties related to meat preparation. Work in or around boiler or engine rooms. Work in connection with the maintenance or repair of a building, machines or equipment. Operate a motor vehicle, ride outside of a vehicle or load a motor vehicle with other than light hand tools. Catch or coop poultry for transport to sale or to market. Engage in communications and public utility work. Sell or attempt to sell goods, known as youth peddling. Advertise by holding signs, waving banners or wearing costumes. Engage in the construction, demolition or repair of vehicles or on construction sites. Use ladders, scaffolds or other similar equipment. One exception is that minors who are exempt from attending school beyond the 8th grade may work in places where machinery is used to process wood products if on-the-job activities are monitored by a family member who is at least 18. Work in plants or establishments manufacturing or storing explosives or articles containing explosive components. Work as a motor vehicle driver or in a job that requires the minor to ride outside of a vehicle. Work as any kind of miner. Most firefighting and forestry work. Most work involving power-driven woodworking machines. Any job that involves exposure to harmful substances and to ionizing radiations. Jobs that involve power-driven hoisting apparatus or power-driven metal-forming, punching and shearing machines. Work with power-driven meat-processing machines and in jobs involving slaughtering, meat and poultry packing, processing or rendering. Operating balers, compactors, paper products machines, circular saws, band saws, guillotine shears, chain saws, reciprocating saws, wood chippers and abrasive cutting discs. Work involving the manufacture of brick, tile and kindred products. Work involving wrecking, demolition and shipbreaking operations. Any jobs in roofing operations and on or about a roof. The Indiana Department of Labor employs inspectors who investigate potential violations of the state's child labor laws. Inspectors have the authority to inspect the working conditions and certification of any Indiana employer. If a violation is assessed, penalties for minors include a warning letter for a first violation and a 30-day revocation of their work permits. Employers found in violation of child labor laws will be issued a warning letter for a first offense and increasing fines between $50 and $400 for each subsequent violation. For violations of federal child labor laws, including for minors working in hazardous and prohibited occupations under the FLSA, the penalties can include a fine up to $10,000 per violation, as well as possible criminal charges. Brooks, Sally. "Indiana Work Permit Rules." , https://legalbeagle.com/6296983-indiana-work-permit-rules.html. 14 February 2019.